just placed an order on ebay.in for this mobile at 6170/- INR. - Predictive text input.Please someone tell me. 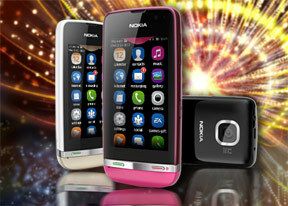 Because I am planing out to purchase one mobile among these mobile- Samsung Galaxy Y Duos, LG L3 E405 and Nokia Asha 311. Which one should I Purchase? Will update my review as soon as get mobile in hand. can this phone install INSTAGRAM? Jacky, 04 Sep 2012Actually in phone features it shows only 2 MP, but there is one more setting in Camara (PIX-8.... moreJacky, are you a real suggestor or what as i have seen much suggestions to be given to the customer and also found the good comments about you. sam, 03 Sep 2012i want to buy this phone can any one tell me what is the camera quality,i use 5233. Actually in phone features it shows only 2 MP, but there is one more setting in Camara (PIX-8.00), if you do this you can use 5 or 8 MP, Any more doubt.?????? nathskie, 03 Sep 2012is this phone comes with android features? and is it comes with different font styles?????????... moreHey bob! iI have read your question and just thought of giving you some suggestion about this phone. i always prefer this phone only because it support both athe android and simbian software and also you can find 100+ font styles. where you can use whichever you want. I hope this would helpuful to you and you will fell gerat experience after using this. I am not being able to configure my gmail account on this set.tell how it can be done. EA Games, 04 Sep 2012does anyone downloaded the free EA games? will all EA free downloadable games run on this phon... moreyes, i downloaded some games.all works. does nokia asha support talking tom... if yes on which site can i download it...?